There’s something quite thrilling about seeing someone who is direst need of support and assistance, literally at the brink of destitution, use their mind, their wit and their imagination to beat a path out of perdition. Here in Africa, it doesn’t happen that often- but when it does, the results are simply extraordinary! Check out this short documentary about a young Malawian called William Kamkwamba who at just 14-years old, built a windmill out of scraps with nothing but his imagination and a library book to guide him, saved his family, and then ultimately his village when famine and destitution threatened to destroy them. 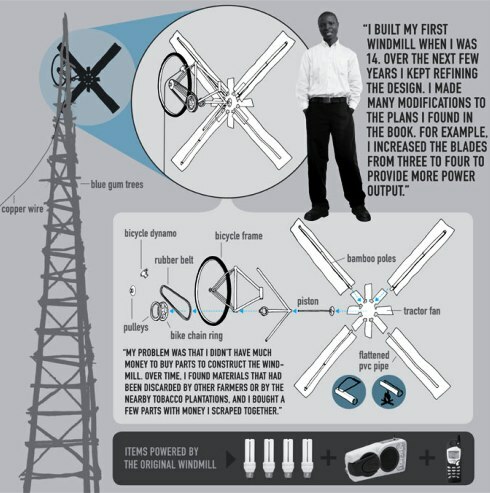 Here’s a graphic explaining how William puts the windmills together, and just what an effect they had. Is anybody else suddenly imagining a way around Eskom and all their crap? Since his amazing story went global, William has had his hands full completing his studies and touring the world telling his story. He even addressed a couple of TED conferences along the way.